We've made some big changes to the government publisher today, with the aim of making life easier for editors and improving the quality of publishing on gov.uk/government. A second change is to the top-level navigation. We have redesigned it so that the options are more clearly laid out, and the things you need to use most often are easier to see and access. Most of these changes are in response to feedback from our editors. For example, people said that the very small + button for adding new documents was hard to find, so now there's a much bigger button called 'Create new document'. We’ve also changed the page you see prior to editing or after saving the document. The purpose of this page is to allow you to review the content and its history, as part of the editorial workflow. The old design was confusing and contained lots of superfluous information in tabs no one ever opened. Even worse, it included what seemed to be a view of the full body text and how it would appear on the site, but it missed out certain sections - for example, on a consultation, you wouldn't see the public feedback or outcome of the consultation content. In our new design, as with the top-level navigation, we've tried to optimise for the common case. This page should give editors just enough information about the document - from the title, summary, history or change notes - to allow them to decide whether to preview it on the site, or start editing it. We've also renamed some of the buttons to be clearer, so for example 'submit' now says 'submit for 2nd eyes', and the button formerly called ‘delete’ is now ‘discard draft’. We were out on the road yesterday testing these changes with some departmental editors. This showed us that we're on the right track with our changes, although we know there's more work to do and there are further changes in the pipeline. We’d be glad to have feedback on any of these changes and do get in touch if you’d like to be involved in user-testing. Although a bit of a surprise when I saw the changes this morning, so far, I think, they are an improvement. However, you have also made changes today to the way we manage document series. One of the consequences of this is that every time you create a new edition of a document and save it, the document immediately disassociates itself from the document series. You then have to edit the document series to retag the document to it. This problem happens every time you click save - which could be quite often with more complicated publications. We rely on some of our content, such as statistics series, being accessible through document series. And shortly we will be recreating our detailed guides as document series. So there is a considerable risk of links to important documents disappearing and causing problems for users. Do you know when this problem will be fixed? We became aware of the bug on Friday and fixed it the same day (within 2 hours of hearing about it). Sorry that we didn't catch it beforehand. You now add documents to a document series from the document series itself. This is so that we can make a number of improvements to the document series format, such as fine-grained control over how documents are sorted and grouped. 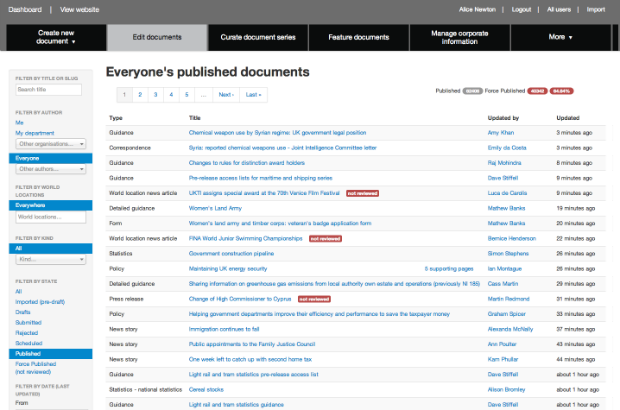 It also means that you can add a load of documents to a series without having to re-edition them all. And it encourages more thought and care about 'curation' of a document series, so that it is a more useful format for end users. Hopefully as we roll out further improvements you will see the benefits of this change. I like the changes but noticed that there is no longer the option to tag a publication as part of a document series. I thought it might be possible to add a new publication to an existing document series through the doc series tab but can't. What should I do? You can add a new publication to an existing document series through the doc series tab, once you enter the relevant document series. Thanks for the news about the document series. Makes more sense. Is the left-hand nav for the document series coming back? We noticed it's disappeared from the series, and the main body text 'jumps' from right-hand side to left-hand side as you scroll down. Anxious authors are contacting us, so any comments on the nav very welcome. We are in the middle of delivering the new features for document series. We have just completed the work to group documents in series under editable headings, and you will see this go live shortly. In our upcoming sprint, we will make a left-hand contents list of the headings you've created in the documents series (you can follow the story here: https://www.pivotaltracker.com/story/show/56260002).